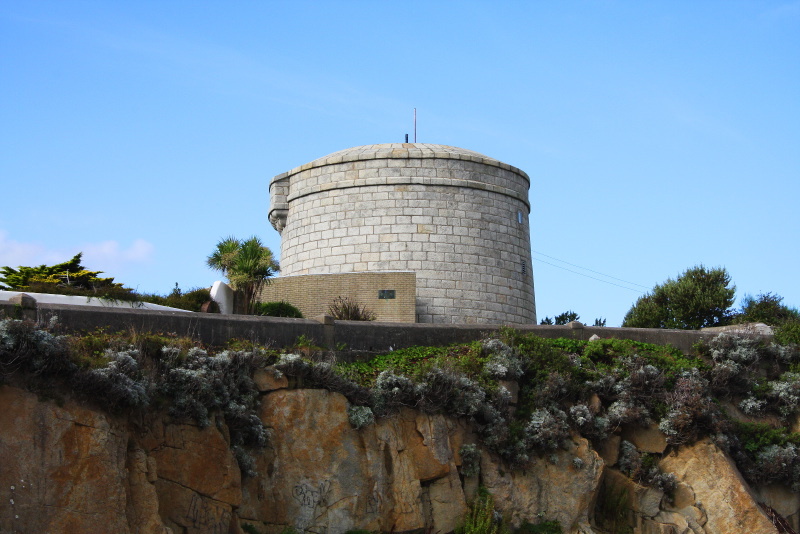 Joyce's Tower in Sandycove, the Alpha and Omega of the Commodius Vicus. 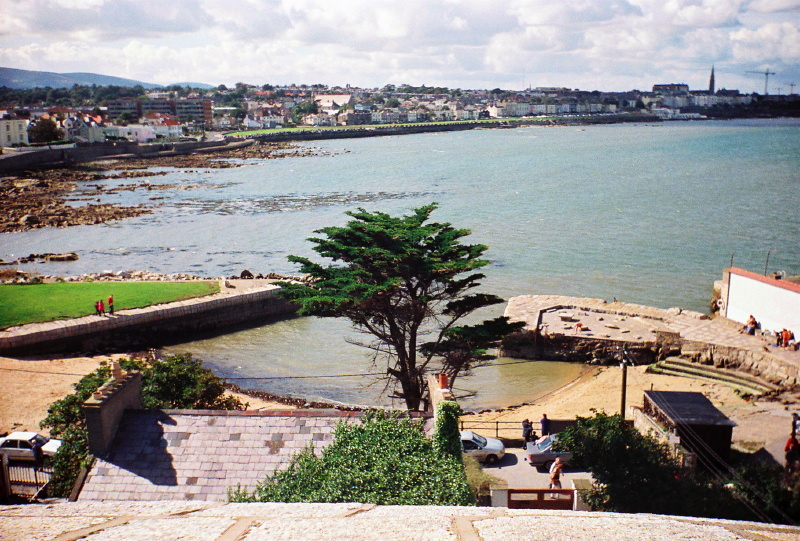 Sandycove and Scotsman's Bay from Joyce's Tower. 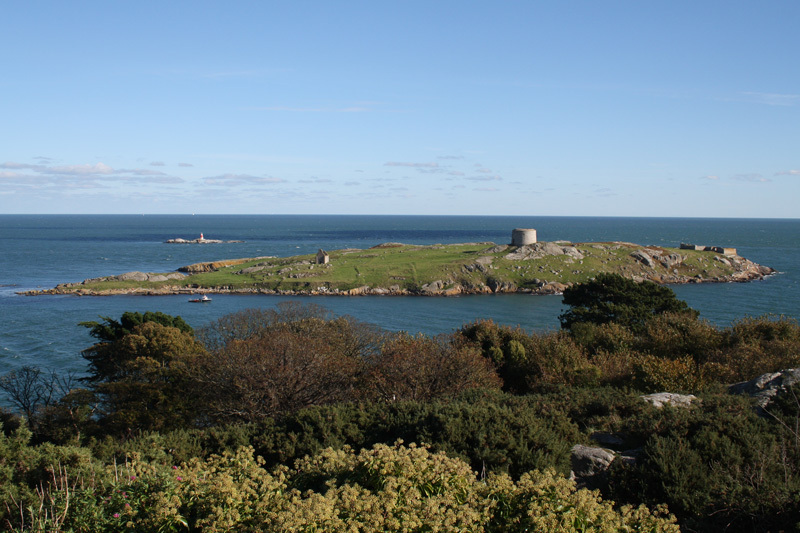 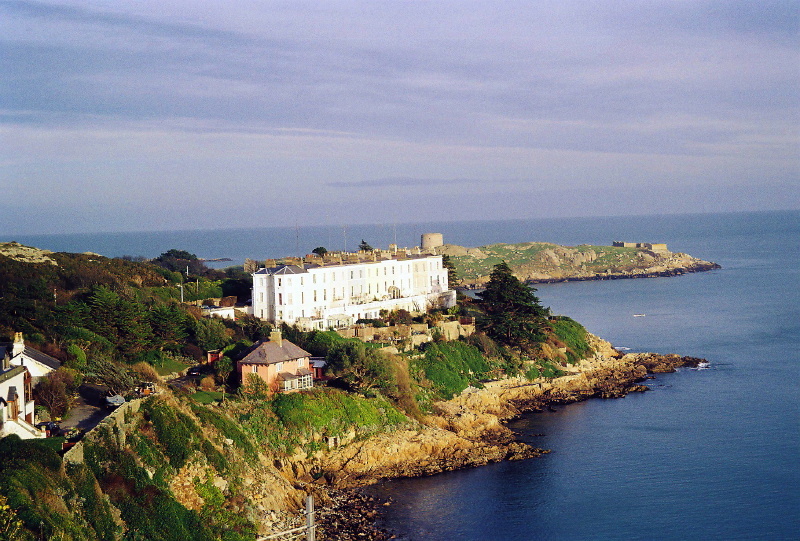 Sorrento Point with Dalkey Island in the background. 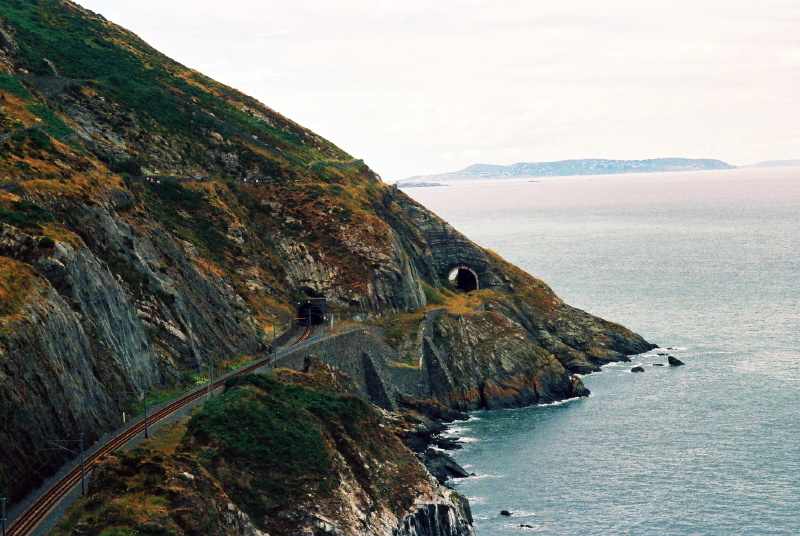 Tunnels on the old and new railway lines, Bray head. 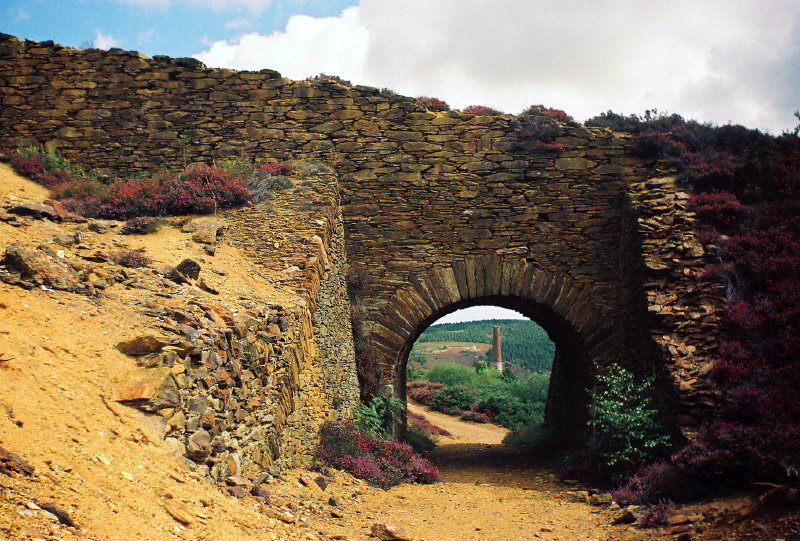 A bridge of the old mining railway in Avoca. 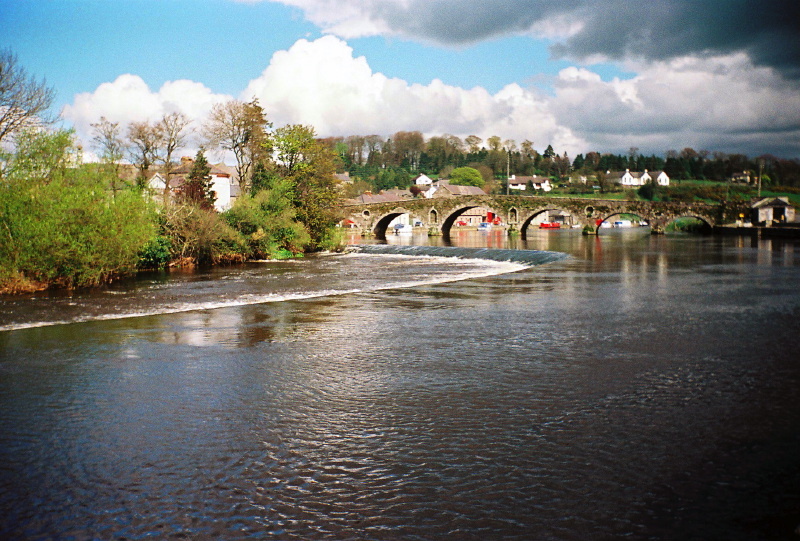 The elegant bridge and wier on the Barrow at Graiguenamanagh. 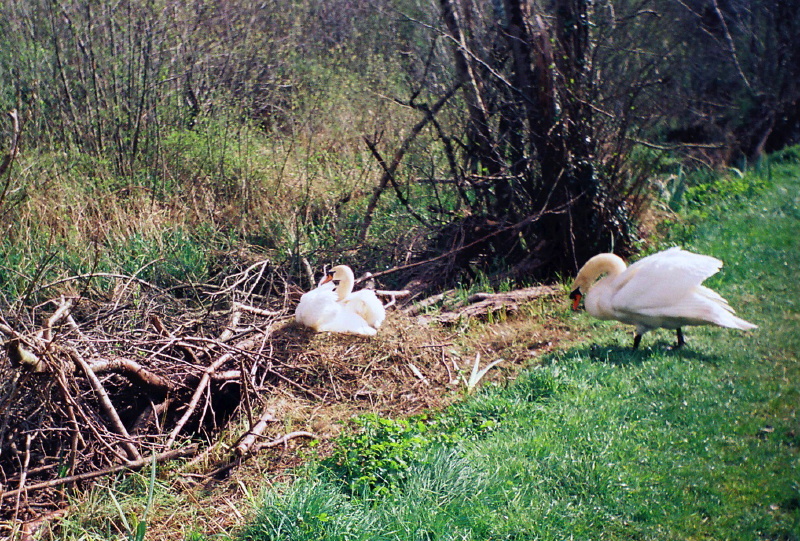 Mr. Swan protecting his wife, by the tow-path near St. Mullin's. 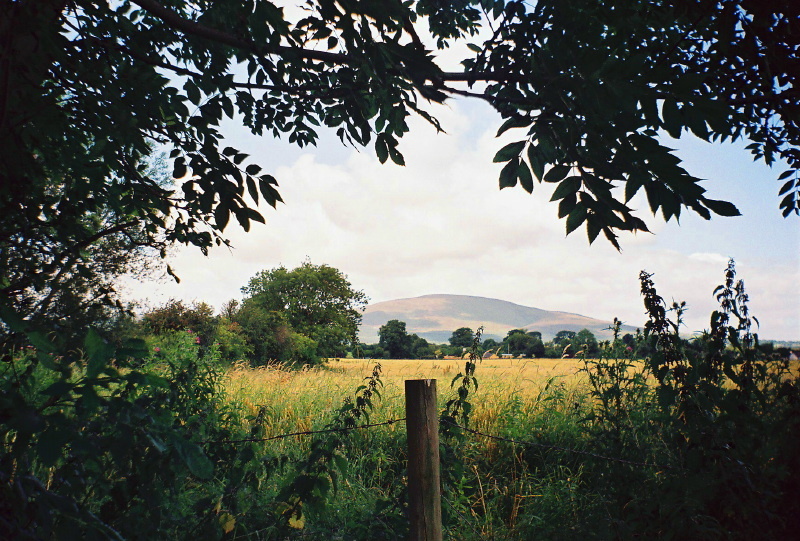 The beautiful and mysterious Slievenamon. 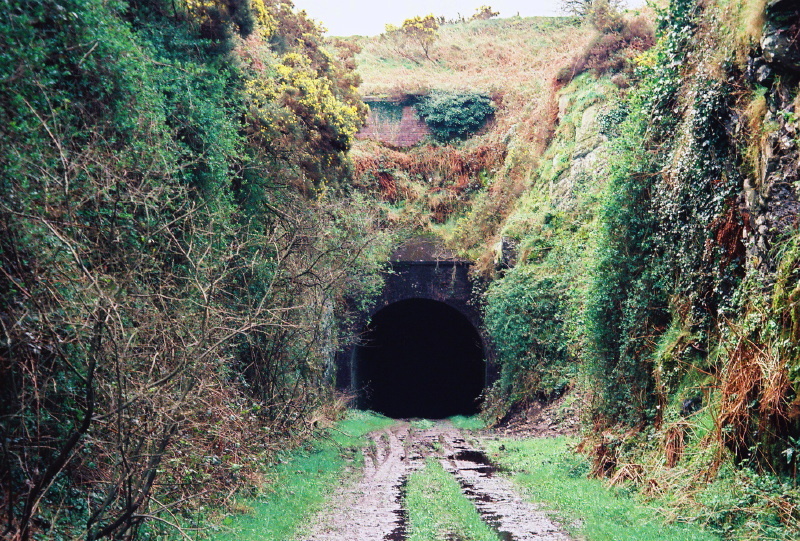 An abandoned railway tunnel at Gogginshill near Ballinhassig, Co. Cork. 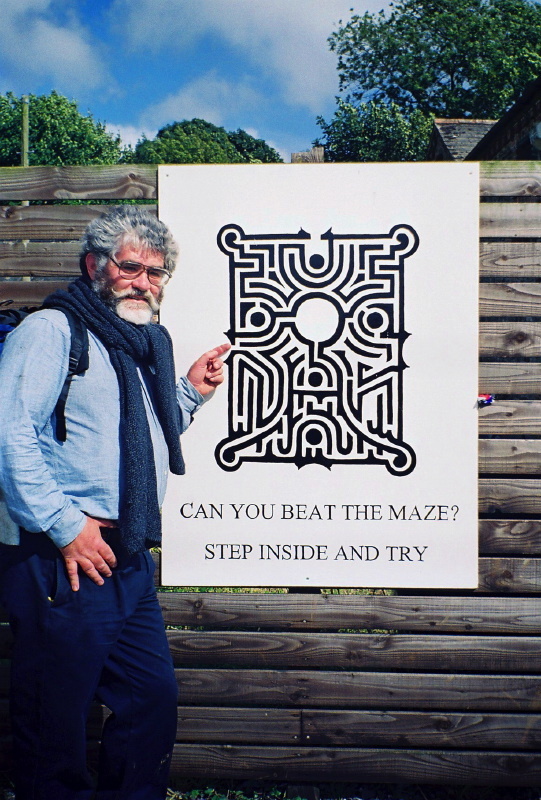 Unravelling the maze at Dunbrody. 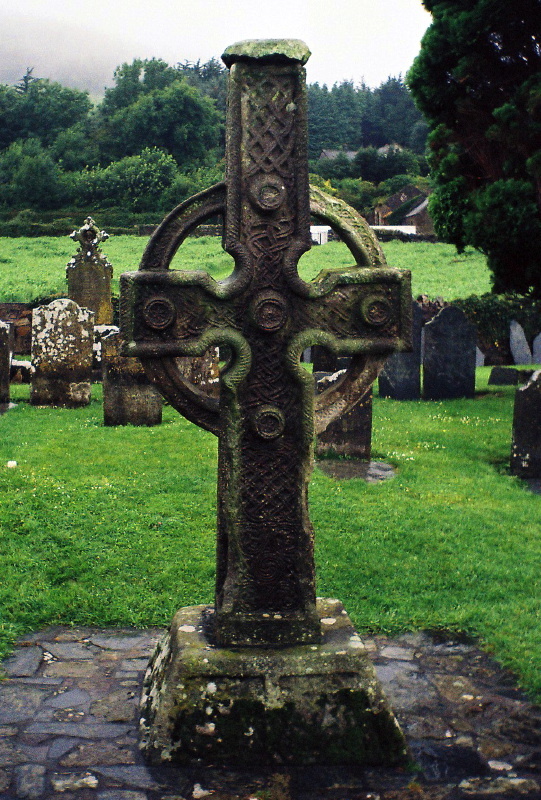 A delicate celtic cross at Ahenny. 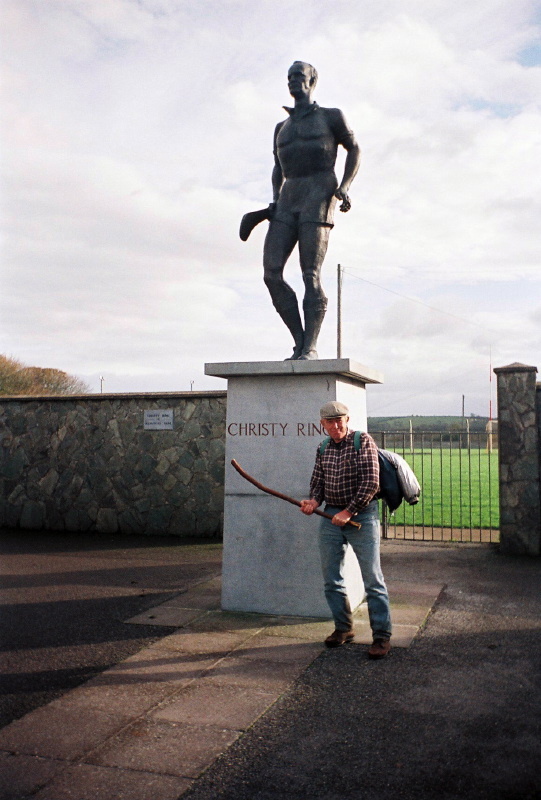 Mark as understudy to Christy Ring, the Cuchulainn of Cloyne. 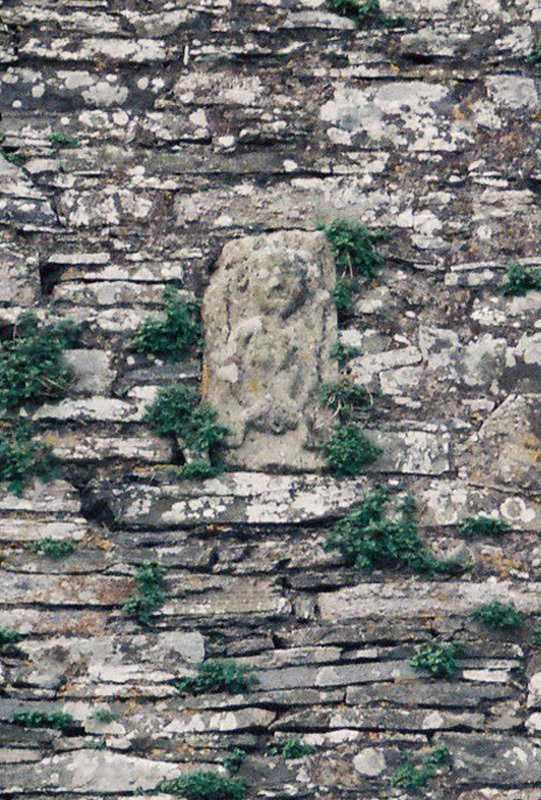 A Sheela-na-gig on the outside wall of Ballinacarriga Castle. 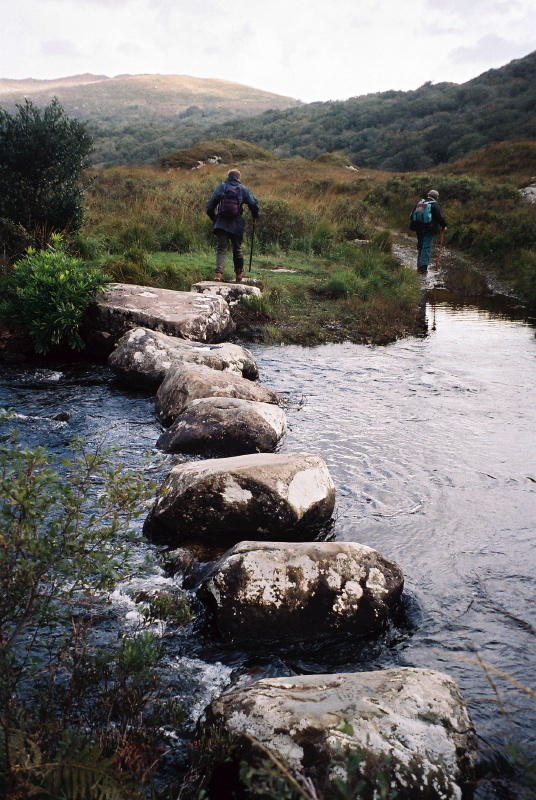 Stepping stones on the path from Kenmare to Killarney. 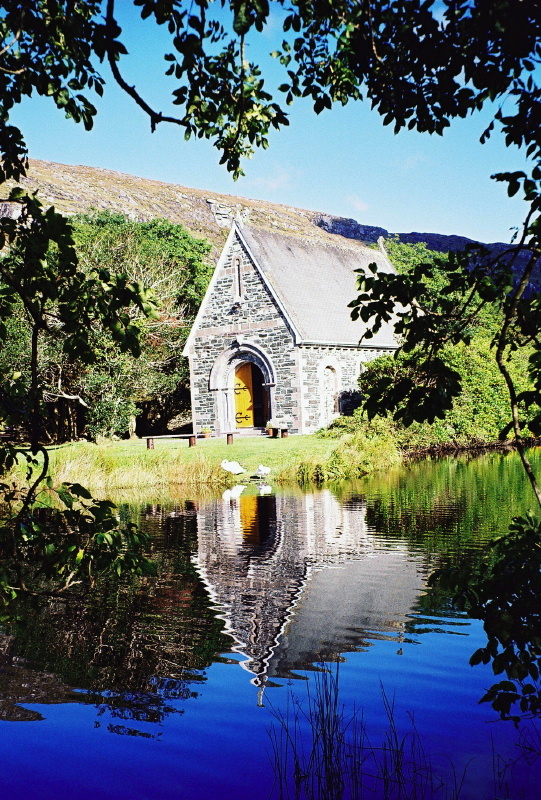 St. Finbarr's Oratory in Gougane Barra, Co. Cork. 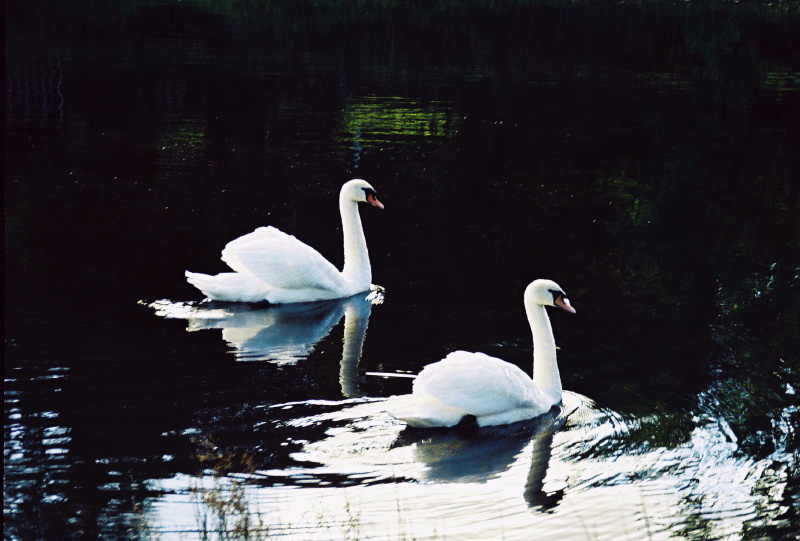 Mute swans on the water at Gougane Barra, Co. Cork. 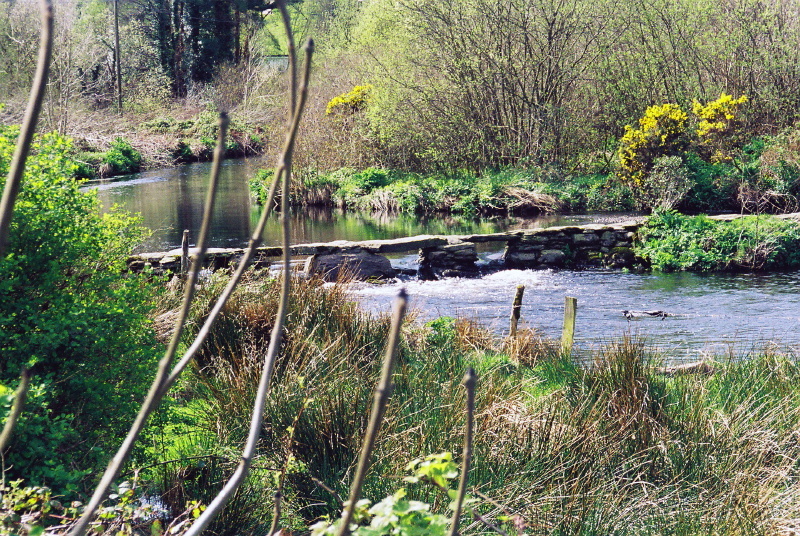 Footbridge over the lovely Lee at Ballingeary. 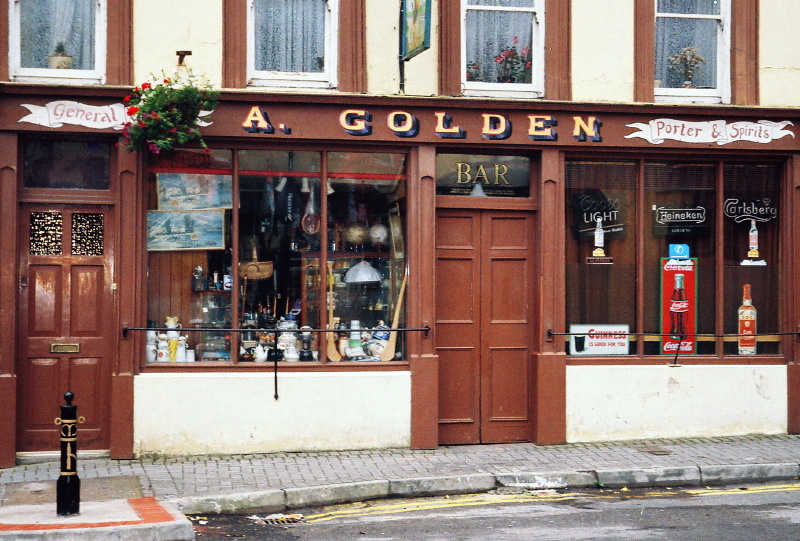 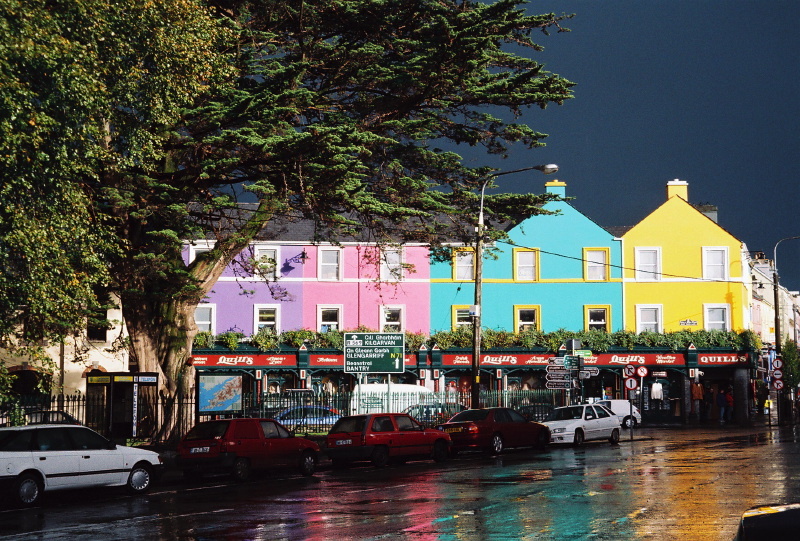 Golden's Public House in Macroom. 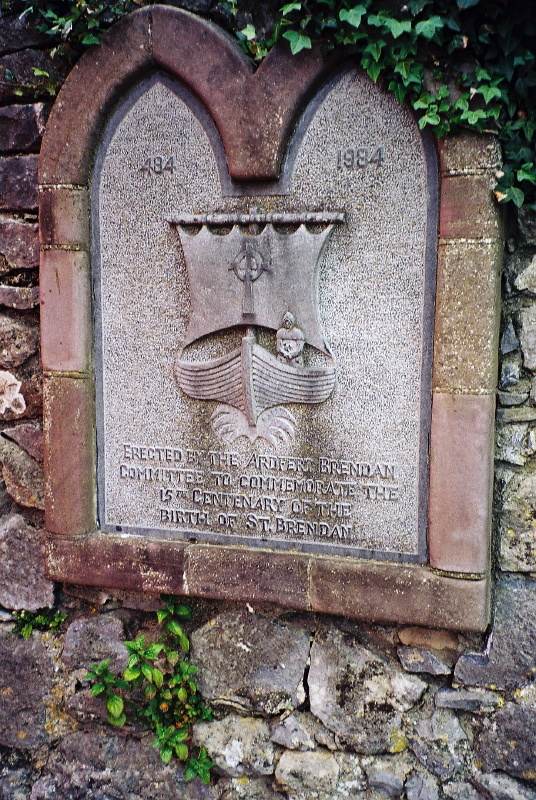 A plaque in Ardfert, commemorating St. Brendan's 1500th birthday. 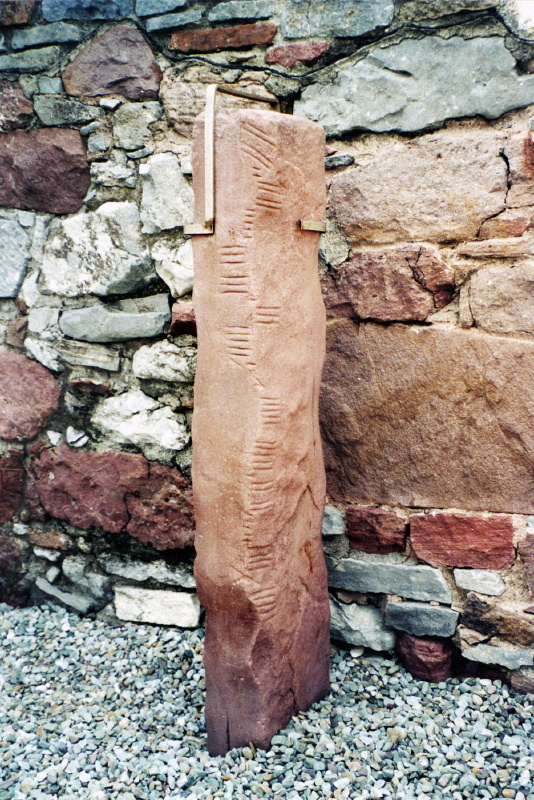 An ogham stone at Ratass Church, Tralee. 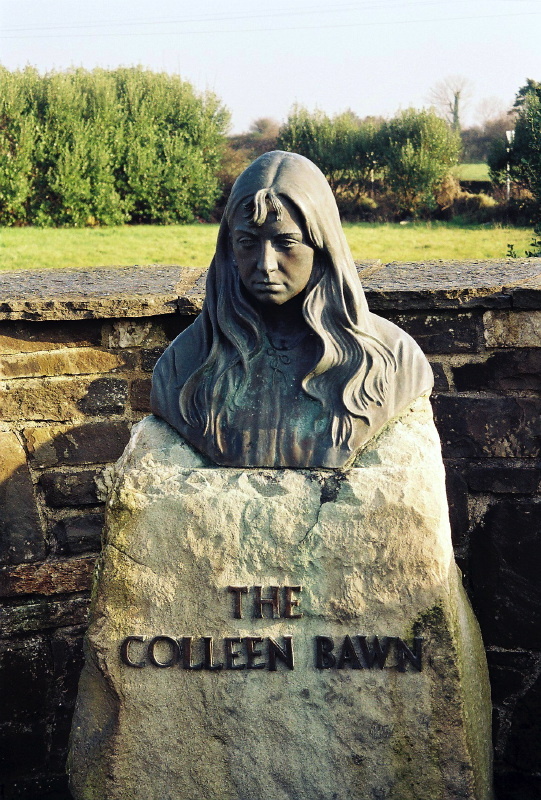 The Colleen Bawn (Jim Connolly, 1987) at Killimer. 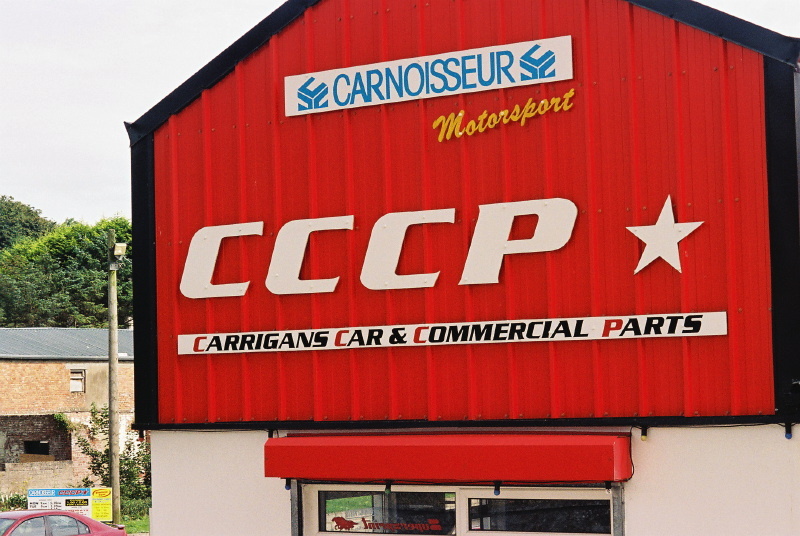 She is is buried in the nearby cemetery. 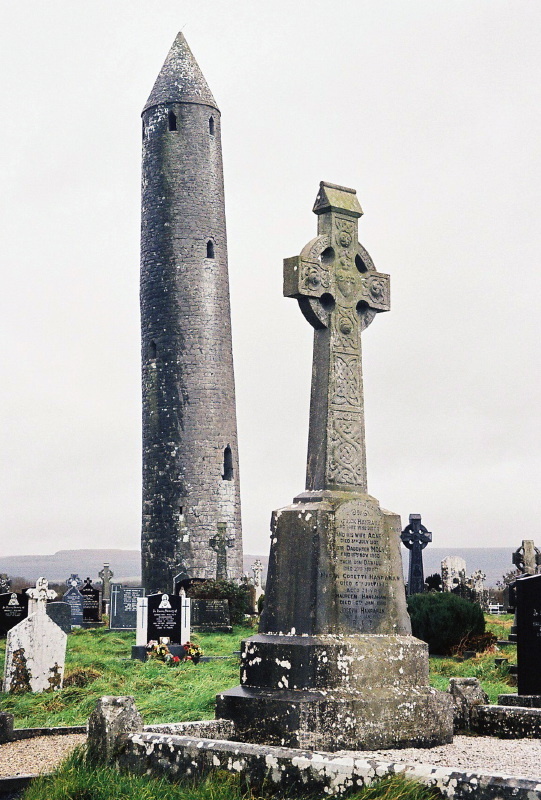 The leaning tower of Kilmacduagh, near Gort. 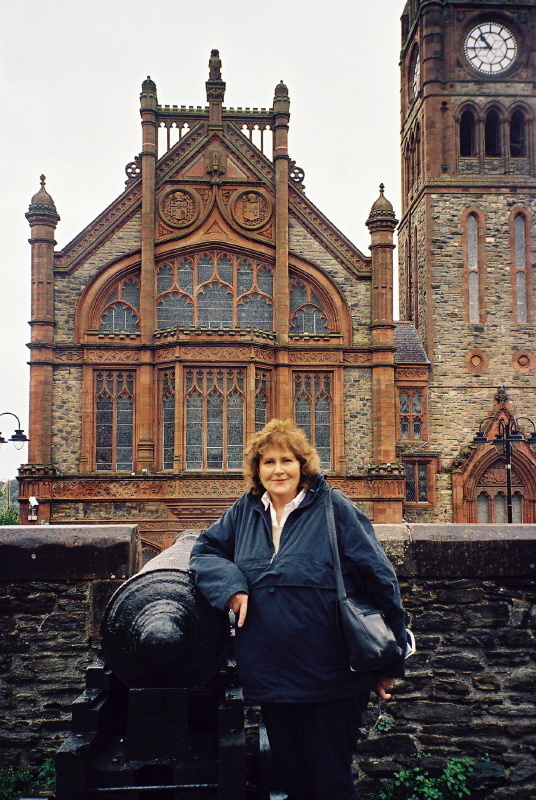 Cabrini guarding Derry's walls, with the Guildhall behind. 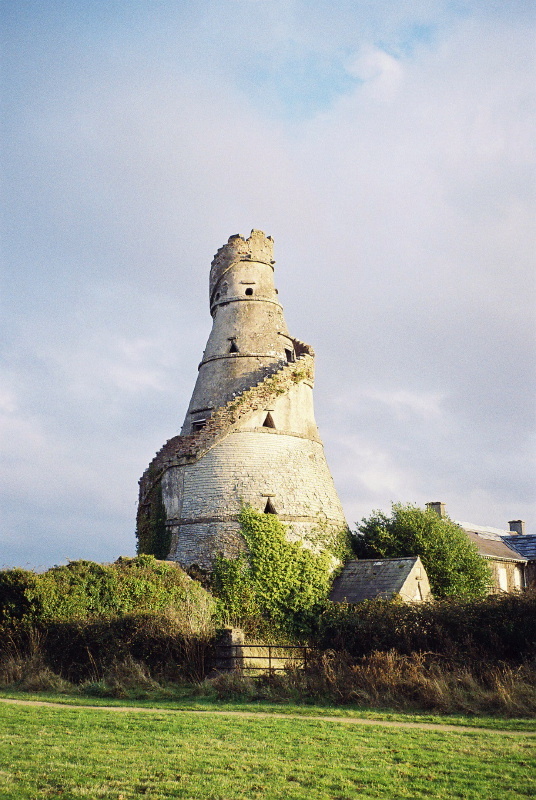 The 'wonderful barn', near Leixlip. 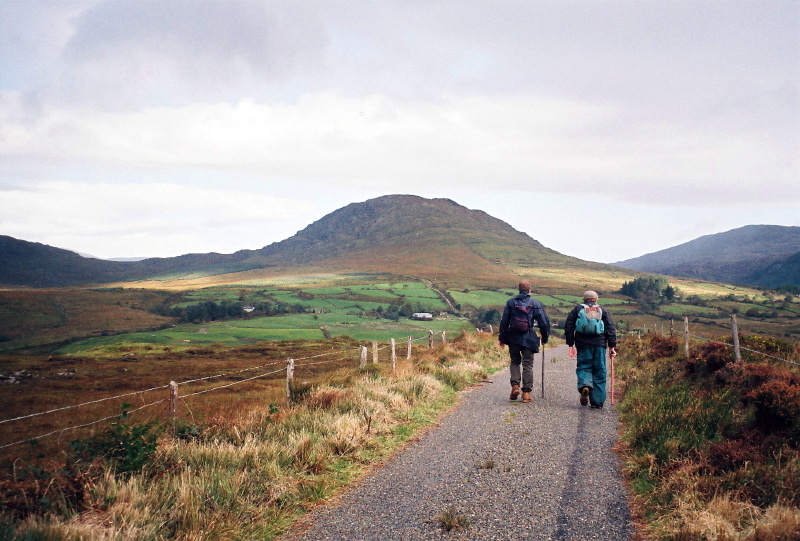 Two Hillpigs heading north from Kenmare to the Windy Gap. 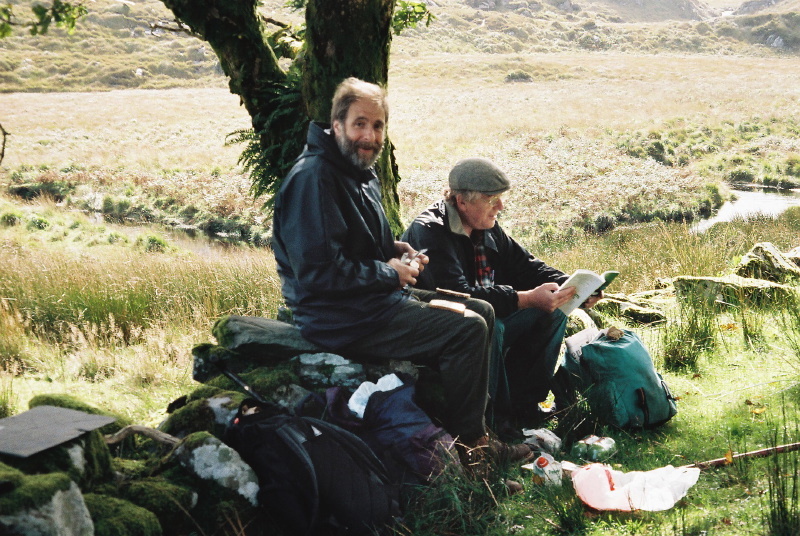 Frank peeling an apple as Mark delivers the First Reading from the Book of Barry. 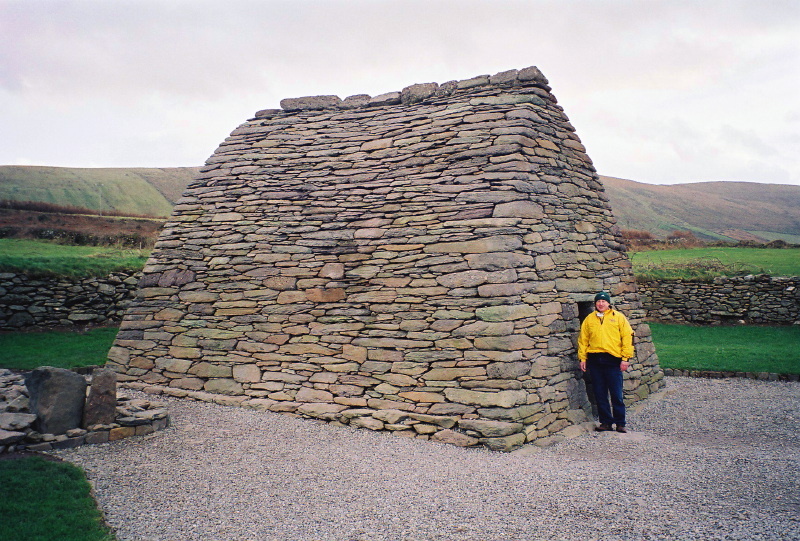 Tom standing by the door of the wonderful Gallarus Oratory. 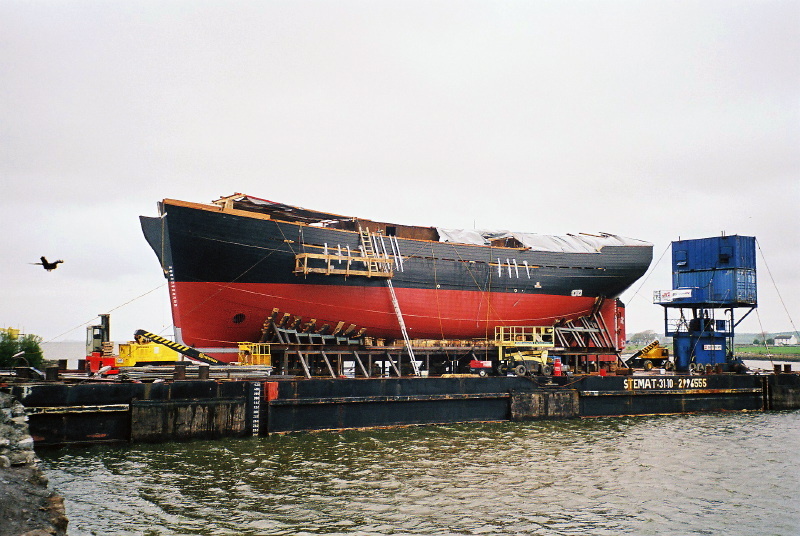 The Jeannie Johnston under construction in Blennerville, Co Kerry in April 2000. 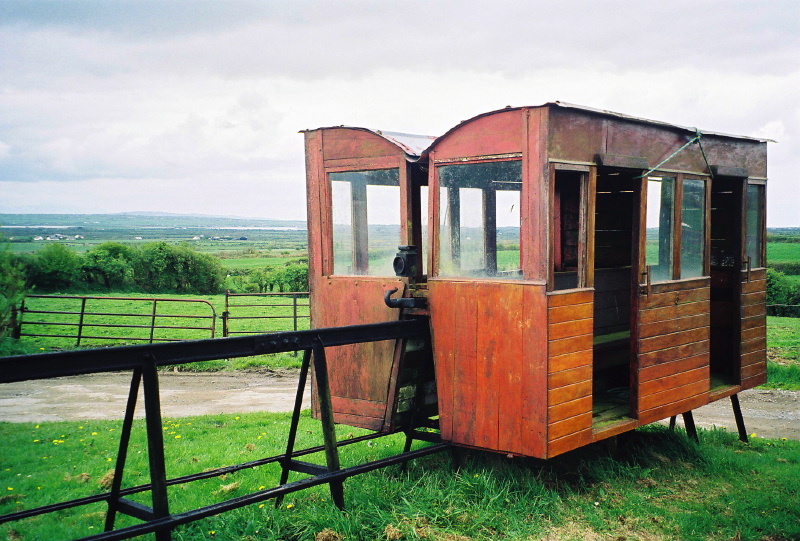 A carriage of the Lartigue Railway. 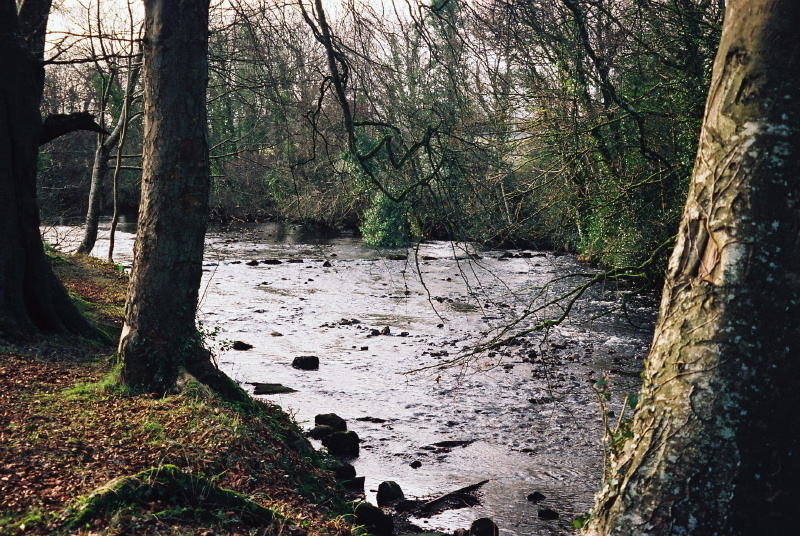 A scene for The Quiet Man at Thoor Ballylee, near Gort, where Maureen O'Hara hopped across the stream, followed by John Wayne. 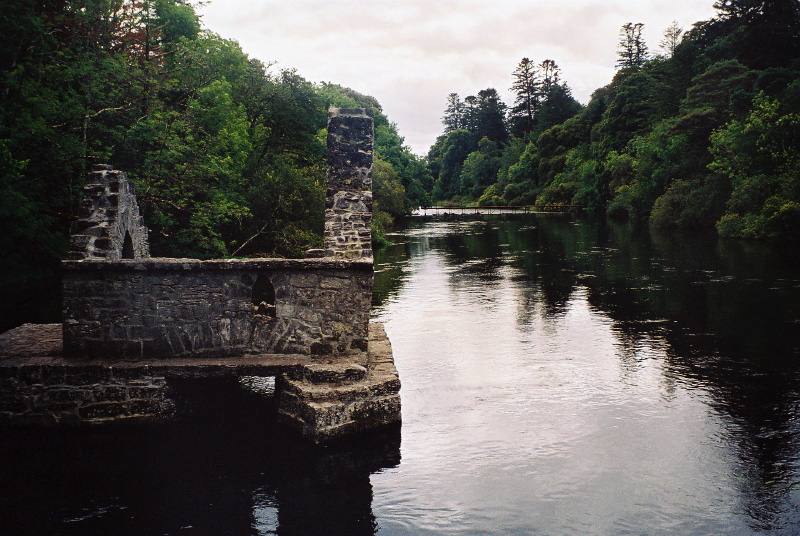 Friar's Fishing Hut at Cong. 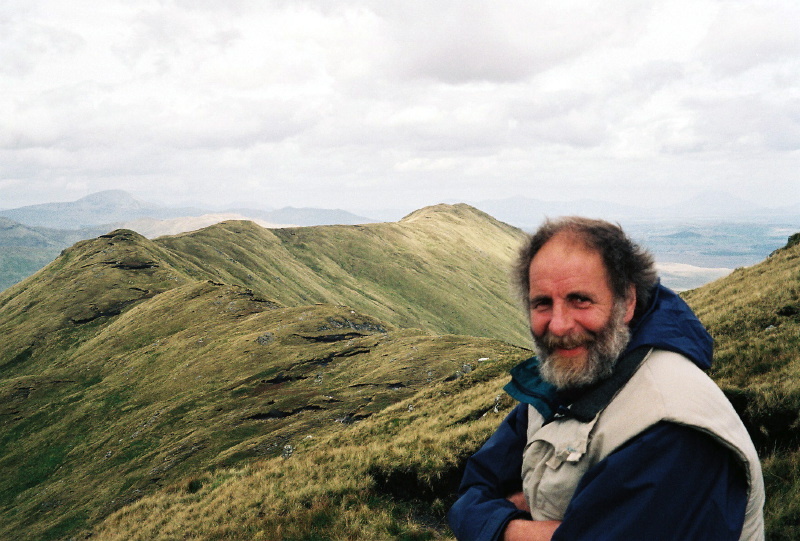 Frank at the summit of Magairli an Deamhain. 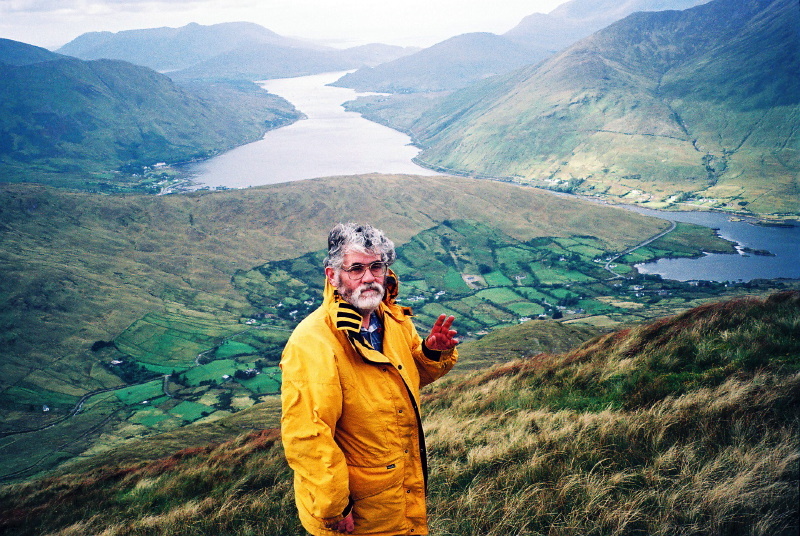 Peter on Magairli an Deamhain, overlooking Killary Harbour. 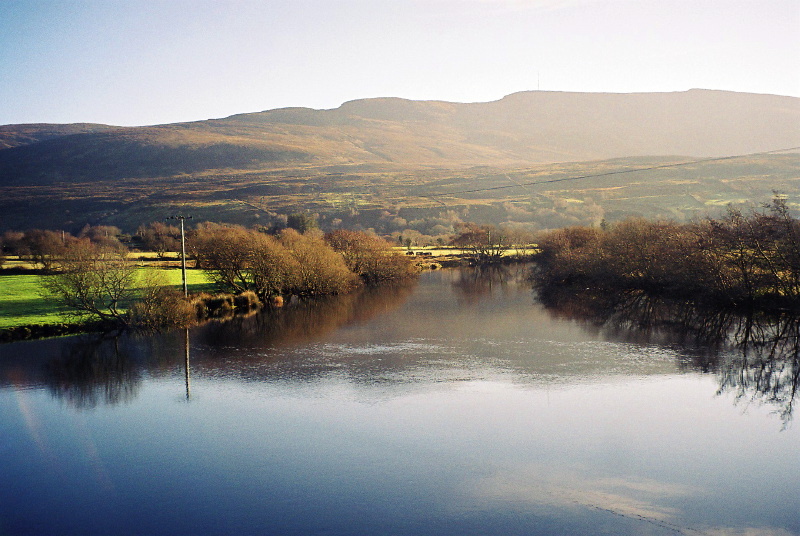 The pleasant riverside walk at Coolaney, Co. Sligo. 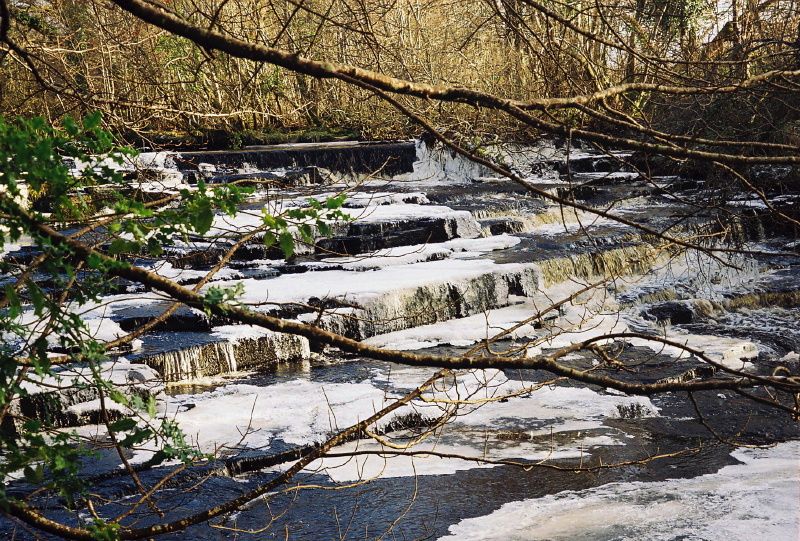 The Roogagh Falls at Garrison, Co. Fermanagh. 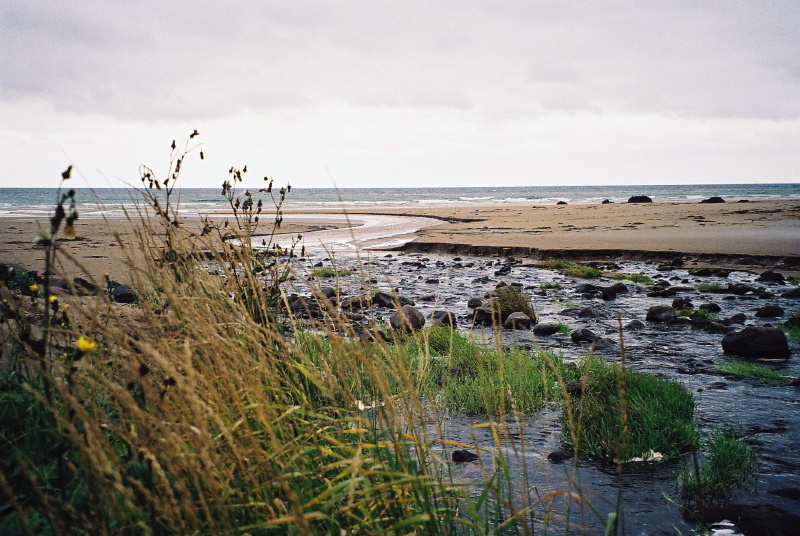 A stream enters the sea at Magilligan Strand, Co. Derry. 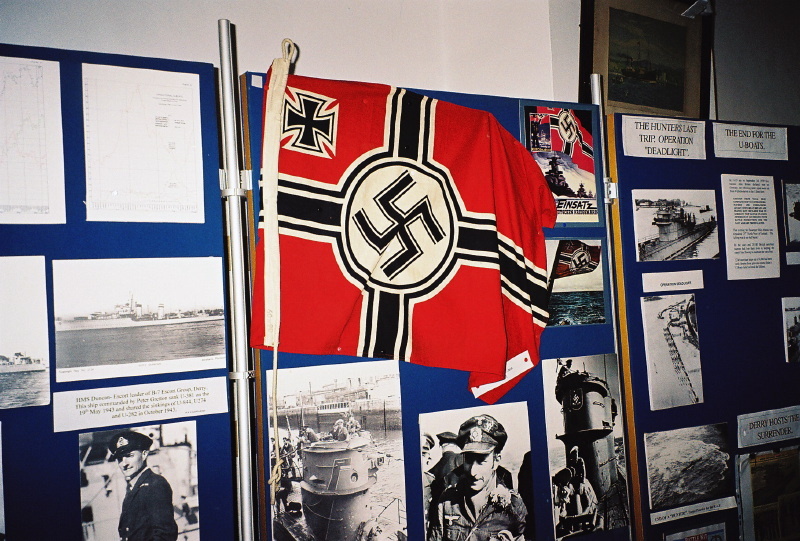 Flag from a U-boat, at the Inishowen Maritime Museum, Greencastle, Co. Donegal. 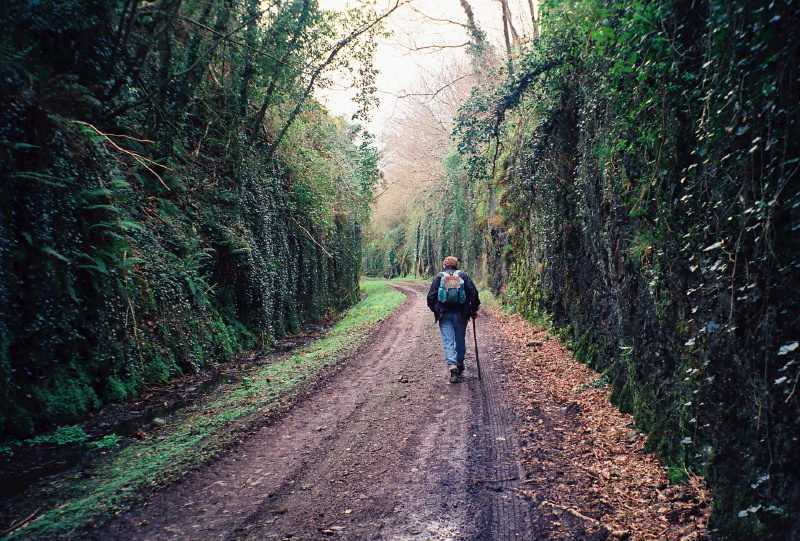 When we saw this we thought we has gone seriously astray. 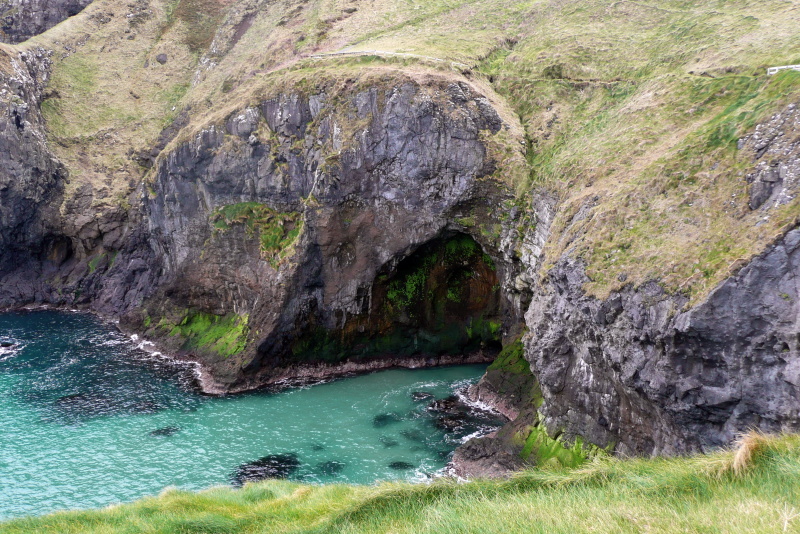 A sea cave on the glorious causeway coast . 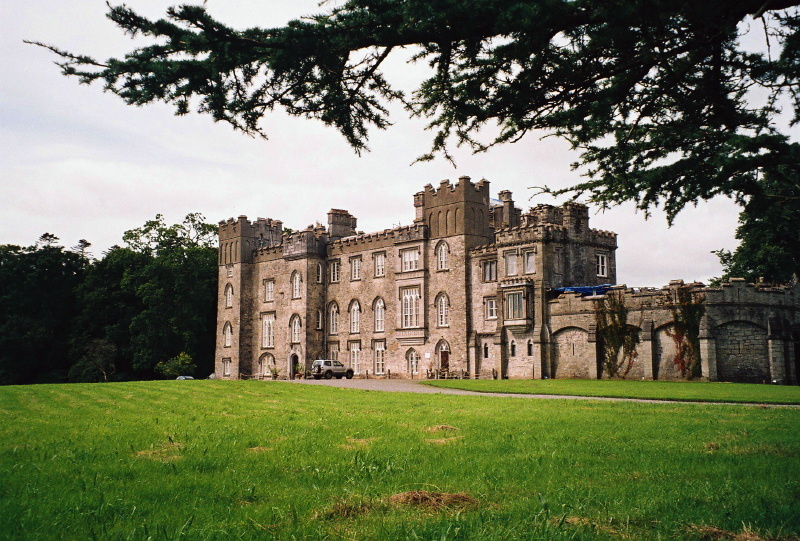 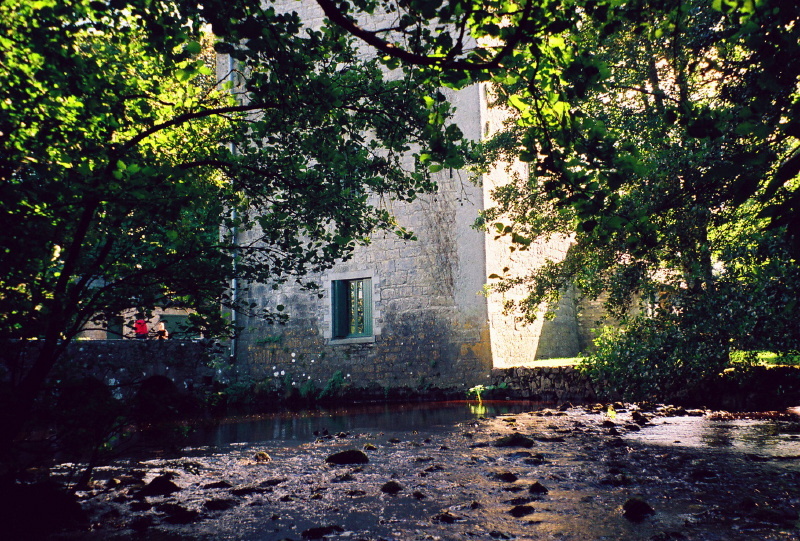 Dunsaney Castle, home of the Plunketts for hundreds of years. 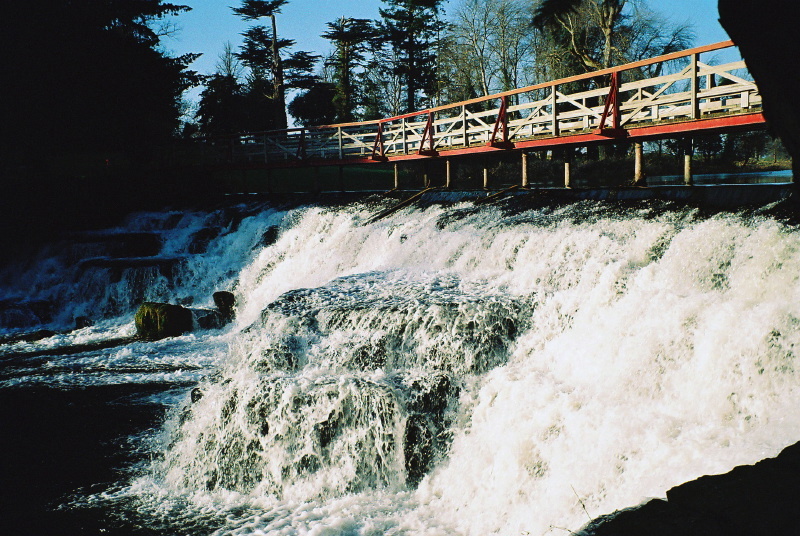 Cascade on Rye Water, in the grounds of Carton House. 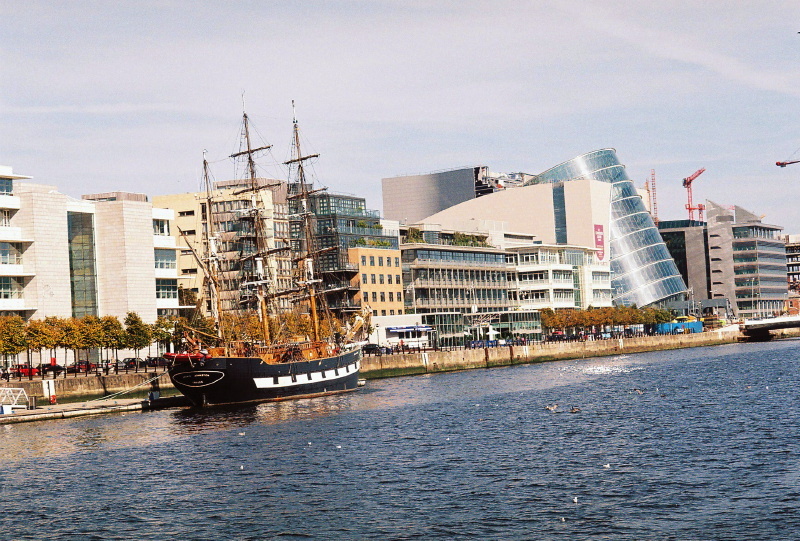 The Jeannie Johnston on the Liffey, with the Convention Centre Dublin behind. 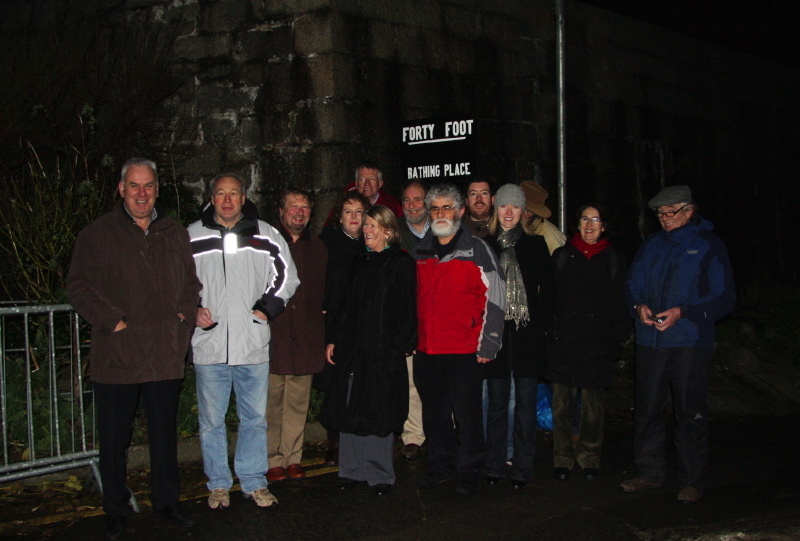 Journey's end, at the Forty-foot bathing place in Sandycove.